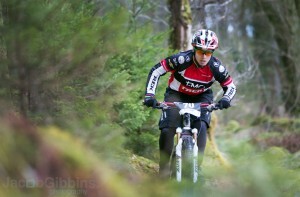 Fort William delivered yet another memorable weekend for me. 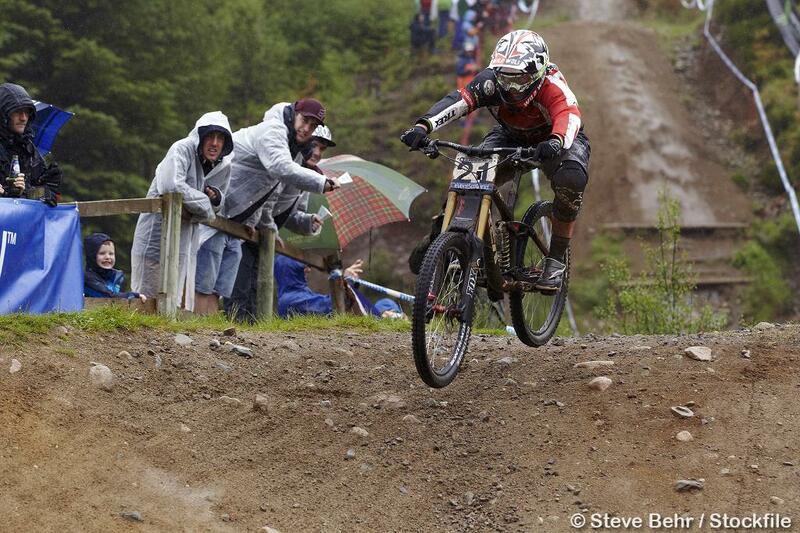 This was the 10th World Cup race I have raced at Fort William and every time I feel so lucky to get the opportunity to ride in front of such an amazing home crowd. It is the best race of the year and it does have the best crowd and organisation and yet again 2012 delivered the same great mix of weather, atmosphere and midges !! 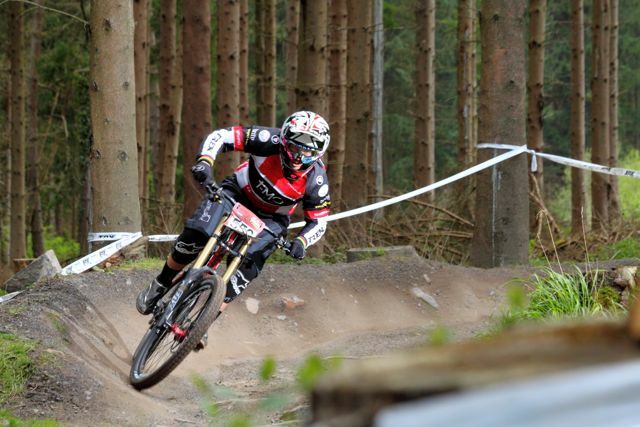 Moving away from downhill racing in 2012 meant that I only got on my DH bike for the first time since the worlds last year at the beginning of May and only had chance for a few days out on it to try and get up to speed ! I felt pretty good during the practice at Fort William but I just didn’t have the same upper body fitness that I have had in previous years and I was starting to feel it by race day ! I would loved to have won for a 6th time in Fort William but realistically it was going to be a lot to expect, so I set myself the goal of making the podium and that would be a great achievement. After qualifying in 7th I knew I would be able to ride better in the final but the weather conditions set in and after a lot of overnight rain the mist and rain was set for race day and setting faster times was going to be hard in these conditions. 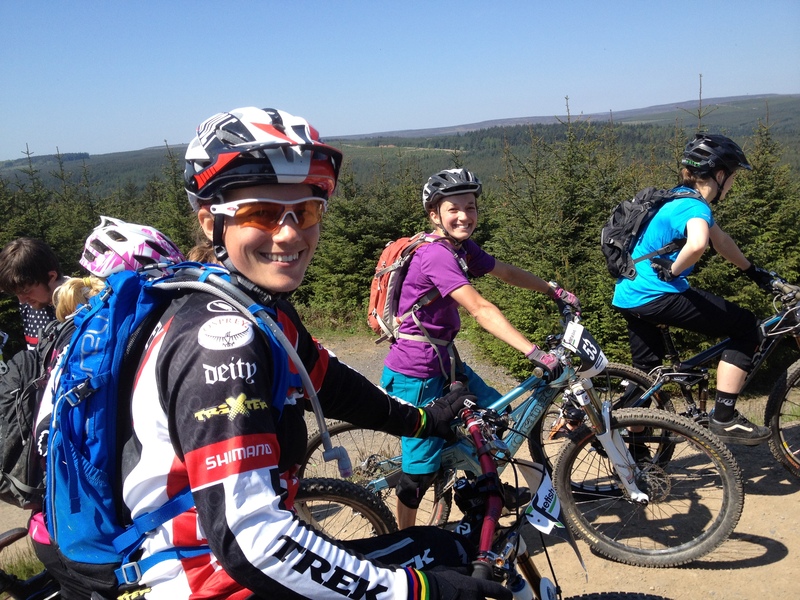 After the horrendous weather of Round 2 we were once again greeted with summer for round 3 of the Gravity Enduro Series. Having spent all week nursing a fairly delicate head I felt pretty rested and ready for the weekend but I just hoped my head would feel ok and keep up ! Thankfully I felt fine once on the bike and I think the short stages and short loop meant I was not going to be out for hours in the baking heat ! 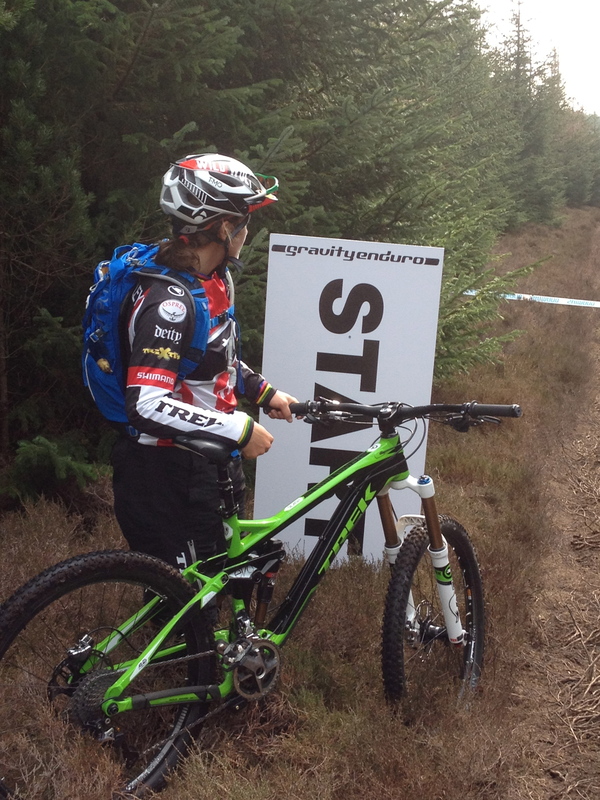 The 5 stages around Hamsterley forest were a complete mix of natural, loamy terrain to man made trail centre. The dry conditions made the man made surface really slippery and made it really hard to push hard in the corners. The complete loop with the 5 stages was only around 20km and it meant that I was able to do 2 laps of the course on Friday and another 4 out of the 5 stages on Saturday morning making me feel as though I had learnt the stages a little more than you can on some of the longer ones ! I knew I would need to learn them well as both Helen Gaskell and Sarah Newman are locals and would be gunning to beat me on home turf ! After a timing glitch on the seeding run we started off Sunday with a clean sheet as the seeding run times would not count. I was not sure if my time for seeding was right or not so I knew I had to push hard on the short stages to get any advantage over the other girls. With the stages averaging around 2min30sec they felt really short and it took me until the 4th stage to finally feel like I was riding well. I had not made any mistakes and pushed really hard on the pedalling sections and all I had to hope for was no mechanicals or punctures this time ! I had been checking my tyres after each stage this time after my lesson in Coed-y-Brenin. The final stage went well and we then just had to wait for the times to be announced later in the day. Its actually quite an anxious wait at the enduro races as you have no idea how you have done until all the stages are complete. The times were up for stages 1 and 5, so I knew I had a couple of seconds advantage after them, but we still had to wait for the rest of the results. The final results were out and I had managed to hold off the locals and took the win by 42secs ahead of Helen Gaskell with Sarah Newman in 3rd. A great weekend and further cementing my love of Enduro races, such good days out on your bike and a great work out at the same time !! 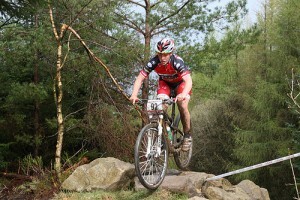 My final foray in to the XC world took place at world cups in Czech and France. Some tough racing and a big crash ended my hopes of getting a top 50 finish. I decided it was time I dusted off the DH bike and just checked that I hadn’t forgotten how to ride one ! There was also a perfect opportunity to race and support a local grassroots downhill event at the Forest of Dean put on by the volunteer trail building group, Dean Trail Volunteers. I definitely felt a little rusty on the DH bike and it felt so sluggish and slow compared to the XC bikes I have been riding so much over the last few months ! However I soon got back into it and realised that you really can just point the DH bike at stuff and it just eats it up ! Even with all my xc and pro sprint training the DH race run still left me breathing hard at the finish !! It’s such an intense event and this one was short and pedally so it was even more of a interval session !! I managed to just take the win ahead of fellow Trek racer Jess Stone and now I have a few more weeks of XC before really turning my hand back to some more downhill in preparation for Fort William World Cup ! Thanks to everyone involved for putting on a great event, even the sun came to visit !! After a tough few weeks of XC racing I was really looking forward to a little more gravity racing this weekend ! With the weather always looking to play its part we managed to find a dry window to get out and ride the first 3 stages on Friday afternoon. Coed-y-Brenin was one of the original trail centres and its testament to how well built the trails are as over 15 years later they are still in good condition. We all knew this round of the Enduro series was going to be a man made trail centre and I was expecting a lot more pedalling than Innerleithen as I have ridden the trails many times and they are xc trails ! The first 3 stages took in most of the old, original Red Bull trail and they were quite pedally but also physically tough as the rock here is just solid and it was a good upper body workout as well as a leg workout ! Stages 4 and 5 were on the new side of the road and took in some of the MBR trail. Stage 4 was a great stage with some flat rocky technical trail at the start then into a new smooth bermed and jumpy free ride trail, some fireroad and a short climb and then a great descent to finish. Stage 5 was a short stage but it had a brutal 45 sec pedal on the flat to get to the finish arena so it was hard one to finish on ! Saturday was a nice dry day for practice and for qualifying. 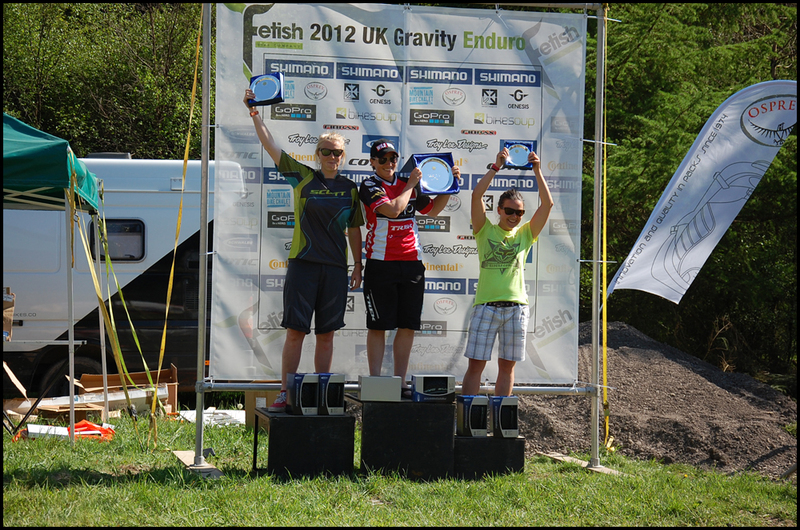 I had a good seeding run, taking 1st place ahead of Helen Gaskell by close to 20 sec. Thanks to Jacob Gibbins for this picture of some dry riding during the seeding run. Sunday as forecast poured with rain all day long ! I was so glad of my new sponsor Endura as this is the first year I have been sponsored by a kit company that makes kit designed for the UK weather !! I ended up riding in my full waterproof jacket and 3/4 waterproof shorts and I even got out my Shimano winter boots to keep my feet toastie all day !! On a day like that good kit really does make a massive difference and I was so pleased to have good kit and the experience / old age to know when to use it ! I saw so many people freezing cold and wet through without any waterproofs. Staying warm was the biggest challenge during the day as once your hands were soaked through the cold wind soon froze your hands when you got up to speed on some of the fire road sections. I had some serious pain as my hands came back to life at the end of stage 3 ! Trying to stay warm required huddling in the trees to gain body warmth !! I was really happy with how I was riding and I really felt the benefits of the XC racing and training I have done since the last enduro as I felt strong on all the pedalling sections. I caught up with my 20sec rider on most stages and on the long and flat stage 3 I managed to pass the whole elite women’s field, so I knew I was going well ! Sadly my luck ran out and about 1 min in to stage 4 I ended up on the floor whilst taking a big berm on the freeride section. Getting up I wondered what had happened, but as I set off again I realised that I had a rear flat ! With a lot of the stage still left I decided to stick a tube in and get to the finish. In the panic of the moment I forgot I had a CO2 inflator and just used my pump like normal, so lost a very valuable 6 mins on stage 4. Sadly I was not able to get that much time back and finished 3 mins back in 5th place. I was pretty gutted as I had worked really hard all day and came away with nothing. I was even more frustrated as I had no idea how I had punctured as I was running tubeless, however investigations the next day when I got home revealed a small dent in the rim and some damage to the bead and sidewall of the tyre, so I must have hit the rim earlier in the day or earlier on that stage which must have lost some air pressure then when I pushed hard in the berm the tyre just burped and lost all the air…bummer. That’s enduro racing and you have to get yourself and your equipment through the whole day. 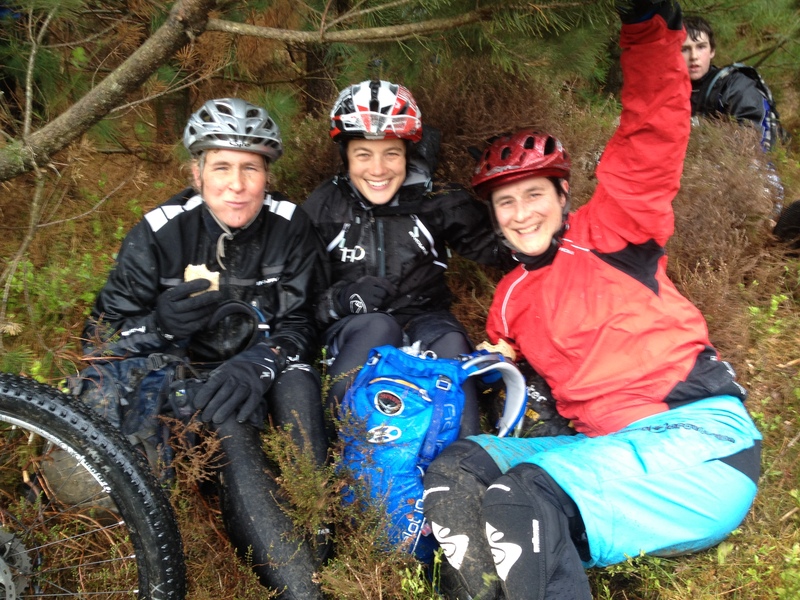 That said I still had a great day and even in those conditions the format and social nature of enduro racing is a winner ! For the first part of 2012 my race schedule included some XC races with my focus being on the Pro Sprint races at the World Cup rounds. Most of the UK national XC races clashed with the UK Gravity Enduro races, but this weekend I was free and decided to travel up to Dalby for round 2 of the National Series. 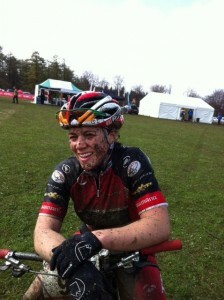 Having only ever raced at Sport level at an XC national I did not know what to expect in the Elite field. Having had such a painful and demoralising experience at the WC at Houffalize last weekend I was feeling mentally down on the XC world ! This weekend would be a little different starting on the 2nd row in a field of 30, rather than being on the back row in a field of 90 women. It meant that I had chance to get a good start and be in the race from the start and not having to walk and queue round the first part of the lap ! Weather conditions were not great and after a massive downpour and hailstorm on the Saturday it left the start filed pretty muddy by race day and the start loop was pretty wild. I got some great speedway style drifts going on as I managed to get up to 2nd and followed Annie Last around the start loop. It was great to get to ride for a short time with Annie. 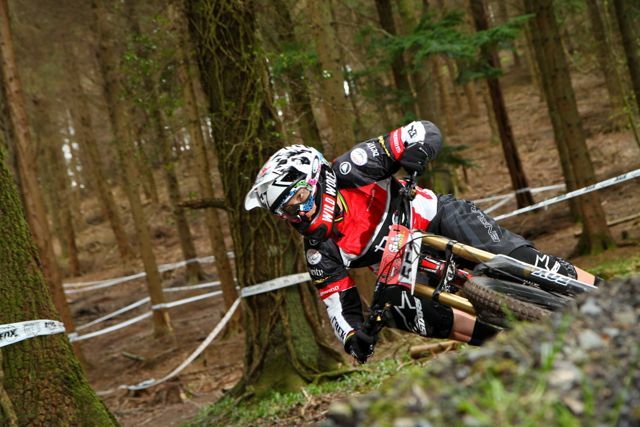 She really is a great talent for the UK and she really can ride a bike up and downhill which is great to see ! I just couldn’t maintain her pace after the first start loop and thought I would just blow up if I tried to stay at this pace for much longer ! I gradually got overtaken by 2 visiting foreign WC riders and Scottish talent Lee Cragie during the first main lap and came through after lap one in 5th pace. I was happy with that, but sadly I still had 3 laps to go ! I kept reeling in Lee and the Japenese girl over the next couple of laps after the technical section and down Worry Gill and then the gap would open up again as we had to climb back up the long climb from Medusa’s drop ! 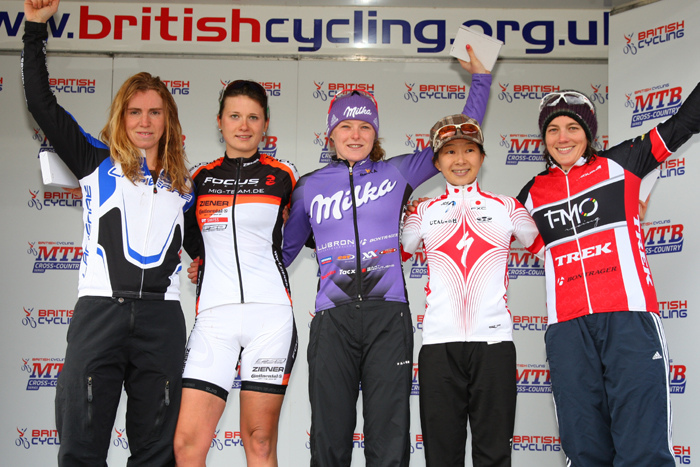 I did manage to maintain a decent pace and held my position to take my first ever Elite XC podium at a National ! 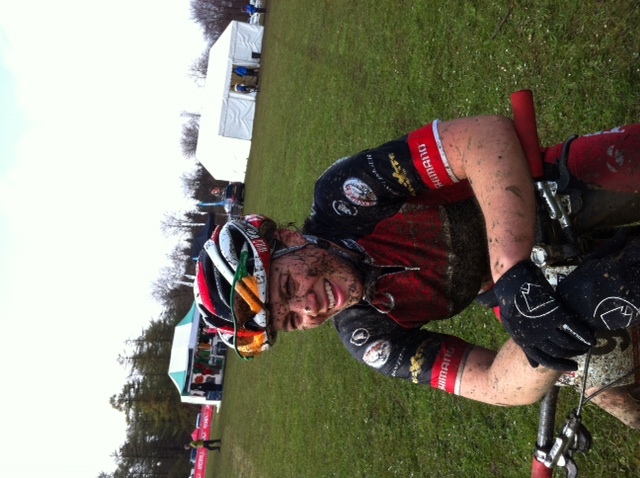 The muddy conditions definitely played into my strengths as the course was tough and got pretty cut up in places. I think I also learnt a lot about racing XC as my last lap was one of my fastest, showing that I really could have gone harder at the start as I still had something left at the end ! This XC racing really is tough, I have so much to learn about just how much you can push your body over a long period of time ! Next weekend it’s back to some Enduro Racing. I think the 5 minute stages will seem easy now after this !! 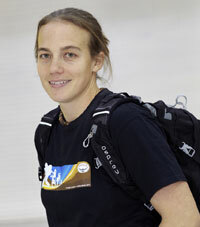 (London) – Tracy Moseley announced her list of sponsors, and provided additional details of her 2012 race plans while at The London Bike Show last week. Tracy sat down for a Q&A session alongside World Cup commentator Dan Jarvis. She spoke of how the T-MO racing idea came about and her plans for 2012 in more detail. 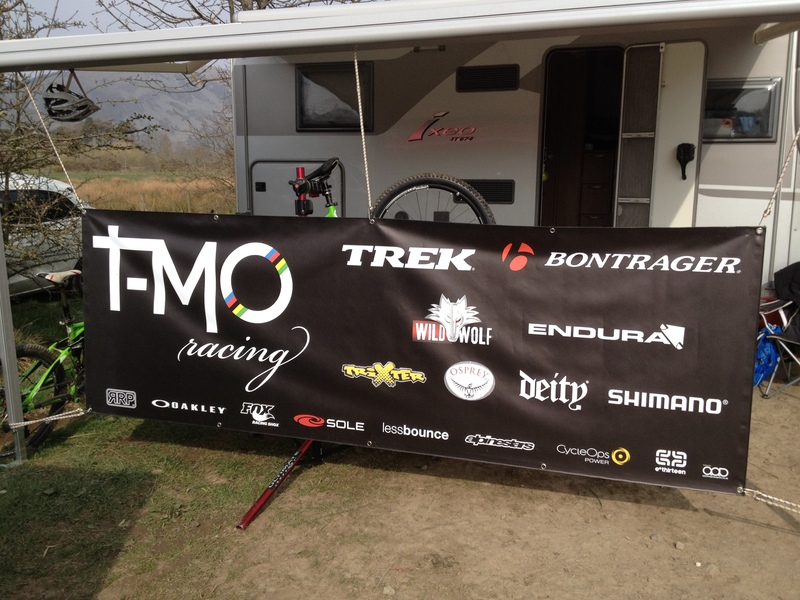 The sponsors that will be supporting Tracy in 2012 are a mix of companies Tracy has worked with for many years, with the addition of some new sponsors for 2012.